ULSTER BANK HAS said it will work to ensure that no customer is “left out of pocket” as a result of a glitch that resulted in money disappearing from accounts. The bank said the issue, which was the result of “human error”, has now been resolved. However, some customers have said they are still experiencing issues. Yesterday many customers said money that had been transferred into their accounts was no longer appearing. Some people who were affected were abroad at the time and unable to withdraw money from their accounts. The bank said the issue was as a result of a payment file which did not process on Monday night. In a statement, Ulster Bank said the transactions impacted by this issue “have now been applied to all customer accounts”. Any customer who has questions about the issue can contact the bank online or by calling 1850 424 365 (from abroad 00353 1 8047475). Finance Minister Paschal Donohoe yesterday said it was “a very concerning development for any customer of any bank in the state to be worried about where their money has gone”. The Central Bank yesterday said it was is “monitoring the situation” and “in contact with the firm” in relation to the issue. 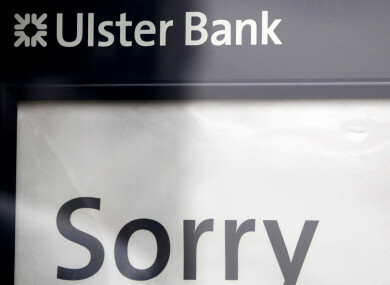 Email “Ulster Bank says no customer will be 'out of pocket' after money disappeared from accounts”. Feedback on “Ulster Bank says no customer will be 'out of pocket' after money disappeared from accounts”.